Introduction: Cardiovascular diseases are the highest cause of death in the world. Many of these deaths may be workplace related. Long hours at work seem to be influencing the increased risks of heart diseases. Workplace stress can be defined as the “discrepancies between the physiological demands within a workplace and the inability of employees to either manage or cope with such work demands.” The varied nature and perception of stress are exemplified from literature that shows stress being either a stimulus, or a response, or a stimulus–response combination, also known as a transactional relationship between one or more individuals and the environment, leading to an initiative toward a physiological standpoint. Methods: This research opted for a correlational study which involves 85 full-time employees who were working at least 40 h per week in a large corporation participated in this study. The Personal and Organizational Quality Assessment and Perceived Stress Scale were used to correlate with heart rate variability (HRV). Objectives: The primary objective of this study is to introduce a new quantitative assessment tool emWave Pro Plus (Institute of HeartMath) and compare heart rate variability (HRV) results with the Personal and Organizational Quality Assessment (POQA) and the Perceived Stress Scale (PSS). Results: Astonishing findings emerged. Significant positive correlations were found between emotional stress and HRV and between intention to quit and HRV. In other words, the researcher has to make sense the following surprising findings: (1) The higher the emotional stress an employee faces, the healthier they are. (2) Healthier employees may have higher intentions of quitting their jobs. Conclusion: The surprising results may be attributed to personality, culture, emotional regulation, and age among others. Cardiovascular diseases (CVDs) are the highest cause of death in the world. Many of these deaths may be workplace related. Long hours at work seem to be influencing the increased risks of heart diseases. Workplace stress can be defined as the “discrepancies between the physiological demands within a workplace and the inability of employees to either manage or cope with such work demands.” The varied nature and perception of stress are exemplified from literature that shows stress being either a stimulus, or a response, or a stimulus–response combination, also known as a transactional relationship between one or more individuals and the environment, leading to an initiative toward a physiological standpoint. Heart rate variability (HRV) refers to the beat-to-beat alterations in heart rate calculated by quantifying the amount of R–R intervals (duration between two consecutive R-waves of the electrocardiogram [ECG]) changes as generated from ECG data. The R–R interval can be influenced by both physical and psychological variables, including certain drugs. Beta-blockers, a drug used for hypertension, have shown to trigger an increase in HRV in some individuals, while other common antihypertension medications, such as diuretics and angiotensin-converting enzyme (ACE) inhibitors, may decrease the overall HRV. Moreover, certain antidepression medications, such as serotonin-norepinephrine reuptake inhibitors and selective serotonin reuptake inhibitors, have been shown to decrease HRV in some individuals. Numerous factors such as age, body posture, gender, physical fitness, breathing cycles, circadian cycles, and mental capacity influence the ANS and heart mechanisms. Furthermore, respiration has a strong influence on heart rate and this phenomenon is known as the RSA. Recent research shows that a reduction in tonic or phasic HF is largely related to the evocation of emotions (behavior and emotion dysregulation) as well as related to symptoms that reflect both internalizing and externalizing psychopathology. These include anxiety, phobias, attention problems, autism, callousness, conduct disorder, depression, nonsuicidal self-injury, panic disorder, trait hostility, thought disorders, psychopathy, and schizophrenia. Furthermore, comorbid internalizing and externalizing symptoms show even greater reductions in HF during an emotion evocation as compared to either internalizing symptoms or externalizing symptoms alone. These altered HF marks have an adverse effect on health outcomes such as CVDs. A reduction in the standard deviation of the R–R interval and RMSSD values indicates a reduction in HRV. For instance, R–R interval variance decreases when age increases, while at rest and change of posture. The reduction in variance will lead to a decreased HRV. The ratio between the two measures, LF/HF, is believed to signify a sympathovagal balance and is used as an index of parasympathetic and sympathetic balance, which is an estimate of workplace stress. The activity of the ANS involves baroreceptors and baroreflex as important components in HRV and autonomic activity. Baroreceptors are stretch receptors in the blood vessels that detect a rise in the blood pressure and signal the heart to slow down. Conversely, these baroreceptors send signals to the brain to increase the heart rate when the blood pressure decreases. The negative feedback loop of the baroreceptors, or baroreflex, works to maintain homeostasis and systemic health. The demand control model of workplace stress suggests that the employees tend to be stressful when the demands are high and the control is low especially when there is very low social support. In other words, there is an imbalance between the job demand and the person's ability to meet those demands. Increased HRV decreases performance anxiety and increases resilience. On the other hand, decreased HRV is associated with mental stress in laboratory experiments which have indicated a lack of mental ability to respond by physiological variability and complexity. If the condition is prolonged, it may lead to CVDs. HRV is relatively lower during work periods. It is consistent with other studies that HRV is a sensitive indicator of workplace stress. Resting has a positive effect on HRV and blood pressure. Intermittent rest periods between works have shown an improvement in HRV. Hillebrand et al. conducted a meta-analysis of eight studies on the relationship between HRV and CVDs among 21,988 participants. These studies used the standard deviation of the normalized N–N interval (SDNN) and LF or HF spectral component as a measure of HRV. They found that a low HRV is associated with a 32%–45% increased risk of a first cardiovascular event in populations without known CVD. An increase in SDNN of 1% resulted in an approximately 1% lower risk of fatal or nonfatal CVD. In what way can HRV be used to accurately measure long-term effects of workplace stress? What are the effects of workplace stress on HRV? In what way does HRV compare with self-reports of stress? What is the overall level of comfort a typical employee experiences? The research study was to explore the effects of workplace stress on HRV, which utilized the power spectral components and key time domain measures of HRV to analyze heart rate data after the employee had self-reported his or her level of stress over two scales: One was the Personal and Organizational Quality Assessment (POQA) (Institute of HeartMath, 1997) and the other was the Perceived Stress Scale (PSS). After these assessments were completed, a correlation between the HRV and both POQA and PSS was conducted. 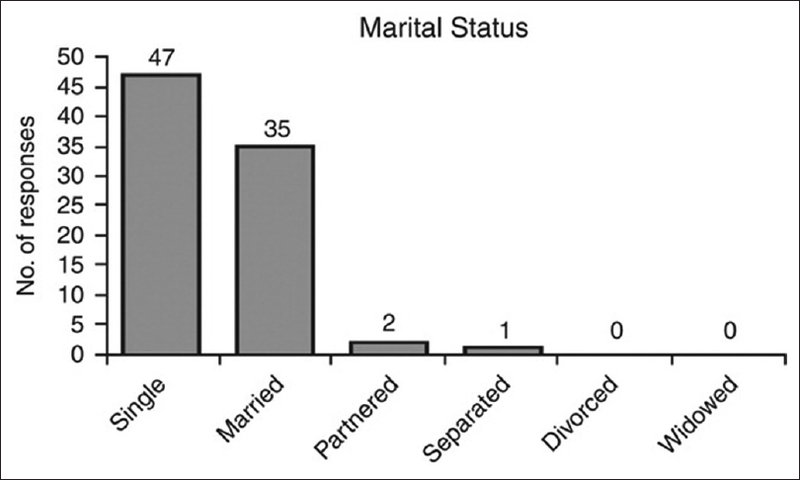 Hence, this study adopted a quantitative research design to quantify relationships between or among variables – the independent or predictor variable(s) and the dependent or outcome variable(s). In this case, PSS and POQA are the dependent variables while HRV measurements such as SDNN, RMSSD, mean heart rate range (MHRR), and normalized coherence are the independent variables. Researchers in correlational studies have collected two or more variables for a specific group of people where the data are numbers that reflect specific measurements of the variables in question. In this study, HRV quantified by the four variables (SDNN, RMSSD, MHRR, and normalized coherence) was correlated with the perceived stress quantified by the POQA-revised 4 model (POQA-R4) rating scale as well as the PSS. The chosen study population was made up of full-time employees in a large corporation of over 500 employees (hereinafter referred to as “Company X”). All employees of the company were welcomed to participate. The full-time participants were working at least 40 h per week. Company X operates out of different locations in Hong Kong, China. The research was conducted in an air-conditioned room on the 19th floor within the temperature between 22°C and 26°C in one of the locations in which Company X operates in Hong Kong, China. The building is unobstructed by the external traffic within a large urban area that has a population density of 639,900. To reduce Type II errors, or false negatives, a power analysis was conducted to determine the sample size for this study. Conducting a power analysis to determine the sample size is an important component in the research planning process. The value for effect size r for Pearson correlation is 0.10 for a small effect size, 0.30 for a medium effect size, and 0.50 for a large effect. On review of the literature to determine the correlation between HRV and the perceived stress of Hong Kong employees, no previous research studies were found on this topic; thus, an estimated medium effect size of 0.30 will be used in this study. The sample size calculator was used to conduct a power analysis to determine the sample size. To achieve a power of 0.80 and an estimated effect size of 0.30, with a significance level, or alpha (α), of 0.50, the total sample size needed for this study is 85 employees. Eligible employees were full-time employees working at least 40 h per week for Company X; male or female; at least 18 years of age; and able to read, write, and understand English. However, employees who had taken any kind of medication that might influence the results or caffeinated/alcohol beverages within 2 h before the session were excluded from the study. After the participating employees of Company X signed the informed consent forms, they accessed the online POQA questionnaire as well as filling up the PSS questionnaire. Once the questionnaires were filled up, the researcher performed biometric tests on the employee using the emWave Pro Plus. Two scales were used to collect data on the dependent variables: PSS as well as POQA. These scales represented operationalization of the dependent variables in the conceptual framework, and both of them had sound psychometric properties. The POQA-R4 is an instrument developed by researchers at the Institute of HeartMath. It contains 49 questions on four major scales of workplace quality directly related to health and workplace performance. The instrument gathers self-reported information on sociodemographic and key psychological and workplace elements associated with the overall quality and effectiveness of the individual and the organization. The instrument uses eight items of sociodemographic information about the respondents' characteristics, which include gender, age, marital status, employment status, level of education, the number of hours worked per week, number of years in the company, and number of years in the current role. The 49 items are divided into four factors which measure emotional vitality, emotional stress, organizational stress, and physical symptoms of stress. They have been empirically validated and found to be reliable based on a measurement study conducted on the existing POQA-R database of 2540 employed adult respondents. The instrument used in this research to measure perceived stress was the PSS by Cohen and Williamson; therefore, the operation definition of perceived stress is the score on the PSS. The PSS is a 10-item questionnaire that measures situations in the employee's life that are deemed stressful. This Likert-type instrument has each item scored 0 (never), 1 (almost never), 2 (sometimes), 3 (fairly often), to 4 (very often). An example question on the PSS is: In the past month, how often have you felt nervous and “stressed”? The total score possibility of the PSS is 56, with the higher the number, the greater the perceived stress. Scores near 13 are considered average, with scores >20 indicating high stress. The Cronbach's alpha internal reliability of the PSS ranges from 0.84 to 0.86. The emWave Pro Plus developed and manufactured by Quantum Intech, Inc. Boulder Creek, CA, USA, designed by the Institute of HeartMath, is a computer software program that collects pulse data through a pulse sensor that can be plugged to a computer [Figure 1]. The pulse sensor can be placed on the participant's earlobe or fingertip. The software then translates the information from the participant's heart rhythms into user-friendly graphics displayed on the computer monitor, which allows the researcher to watch in real time how thoughts and emotions are affecting the participant's heart rhythms. 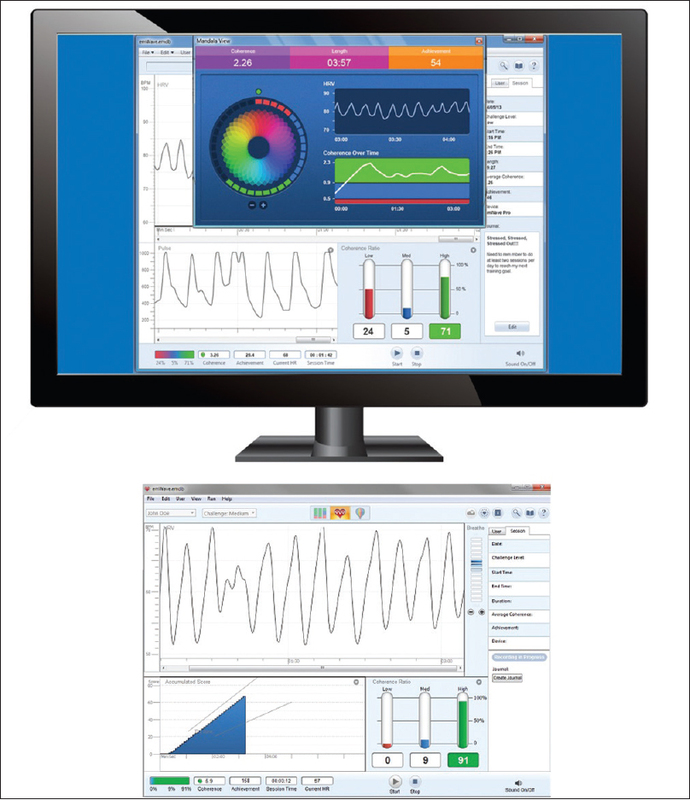 The emWave Pro Plus uses photoplethysmography technology which is a reliable and valid method of capturing and quantifying real-time HRV data, both resting HRV and deep breathing tests based on the ability of hemoglobin to absorb light. As the amount of hemoglobin passed through the blood vessels changes due to the pulsatile nature of blood transportation, the amount of absorbed light also changes. For this research, HRV was measured by various parameters: SDNN, RMSSD, MHRR, and normalized coherence. SDNN is the standard deviation of all mean normal-to-normal intervals measured in milliseconds. The measure reflects the ebb and the flow of all the factors that contribute to HRV and the heart's ability to respond to hormonal changes., The RMSSD is the root mean square of successive differences between the normal heartbeats reflecting the short-term variance in heart rate. This value provides an estimate of the parasympathetic regulation of the heart., MHRR is the difference between the maximum and the minimum heart rate during each breathing cycle. The result is then expressed in beats per minute, as the mean of these heart rate differences for each measured cycle., Finally, normalized coherence is a frequency domain measure of coherence where power in the coherence peak of the PSD is divided by total power. This measure represents the ratio of coherence relative to total power and ranges from 0 to 100. Moreover, a coherent heart rhythm is visualized as a harmonic sine wave-like signal with a narrow, high-amplitude peak in the LF (0.04–0.26 Hz) region of the HRV spectrum. Coherence is evaluated by detecting the maximum (coherence) peak in the 0.04–0.26 Hz range, calculating the integral in a window 0.030 Hz wide, centered on the highest peak in that region, and then calculating the total power of the entire spectrum. The emWave Pro Plus is based on decades of research, incorporating the patented HRV measurement, and has been used by tens of thousands of people in over 85 countries. The data collection schedule was from July 7, 2017, to September 30, 2017. Employees of Company X were invited to participate in this study. A recruitment e-mail was sent to employees of Company X a week before the start of the research study. The recruitment e-mail briefly described the study, the inclusion/exclusion criteria, as well as the compensation (incentive) for the participants if they chose to participate and complete the research study requirements. The exclusion criteria were listed to inform potential participants the reasons why they would not qualify for this research study so that they did not need to attend the researcher's visit, thus further protecting their privacy. At the visit by the researcher at one of the meeting rooms in the official premises of Company X, the participants who chose to participate completed the informed consent process before the data collection began. To fully complete this process, each participant read the informed consent form and was allowed to ask any additional questions regarding the study before signing and dating the informed consent form. Finally, the participant received a personal copy of his or her informed consent form. The researcher determined if the participant was eligible for the research study by asking the participant whether he or she had consumed any caffeinated/alcohol beverages within 2 h before the session. After the participant had signed the informed consent form, the research study data were collected in three sets: (1) online survey – POQA, filled by the participants, (2) pen-filling survey – PSS, filled by the participants, and (3) objective measurements (HRV) collected by the researcher. For HRV measurements, each participant was recorded individually in a quiet room, in a seated position. The participants received instructions for the test and the emWave Pro Plus pulse sensor was placed on their earlobes. Participants were instructed to remain seated, to stay relaxed, and to refrain from making any significant or rapid body movements. Each session started with the 5-min resting state HRV assessment where the participant was told to breathe normally. Once the 5 min was completed, the participants were instructed to breathe according to the six-breath protocol. This breathing method provided a physiological challenge to assess the maximum HRV range (amplitude) during a 1-min period through deep breathing at the specific rate of 5 s of inhalation and 5 s of exhalation. Once achieved, there were six complete breath cycles over the course of 1 min. The emWave Pro Plus software uses a breath pacer to facilitate the regularity of the breathing. The entire minute has to be artifact-free so that the six cycles of the minimum and the maximum can be determined. Participants' compliance has to be closely monitored as insufficient deep breathing or poor synchronization with the breath pacer may result in lower test results. The average duration for each HRV testing session is 7 min. The researcher who administered the HRV test was a HeartMath certified practitioner. Descriptive characteristics and Pearson correlation analysis between HRV measures (IBI, SDNN, RMSSD, MHRR, normalized coherence, total power, and VLF, LF, and HF power along with the LF/HF ratio), POQA scale, and PSS were performed using the SPSS Version 22.0 (IBM Corp, 2013, Armonk, New York, US). The significance level for correlations was set at alpha of 0.05. To correct for skewness, HRV frequency domain measures and RMSSD were natural log transformed before performing the correlation analysis. A total of 87 people signed the consent forms to participate, of which two were excluded due to technical artifacts in the dataset related to the 1-min of six deep-breath cycles protocol. This resulted in 85 participants who completed the HRV measurements, POQA questionnaires, and PSS questionnaires. The majority of the subjects were female (61.1%) and 38.8% were male. 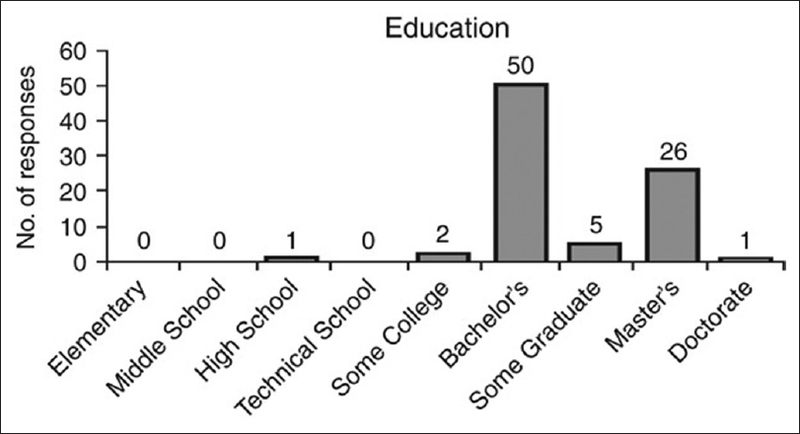 Most of the subjects were within the age 31–40 years (47%). 43.5% were within the age of 21–30 years, and 8.2% were within the age of 41–50 years. 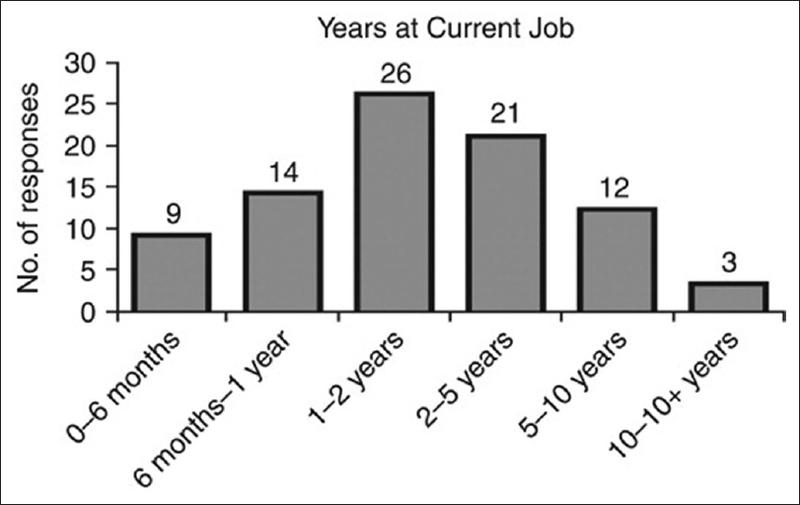 Only one subject was >50 years old and no subjects were under age of 21 years [Figure 2]. 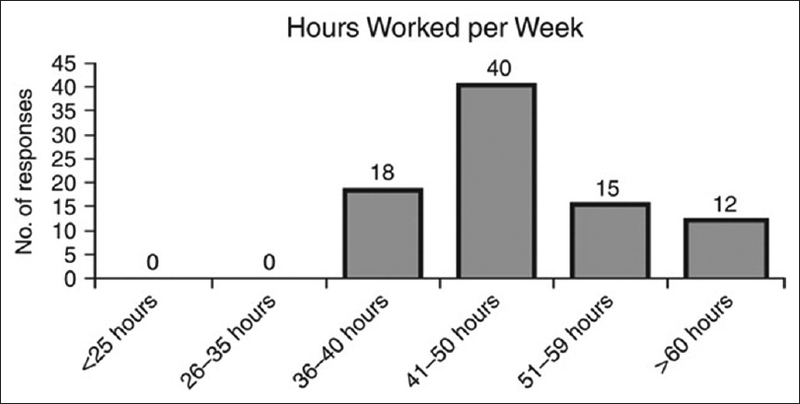 The majority of participants reported working between 41 and 50 h per week (47%); Twenty-one percent of participants reported working between 36 and 40 h per week; 17.6% working between 51 and 59 h per week, and 14% reported working >60 h [Figure 3]. The rest of the frequency tables for the demographic characteristics are presented in [Figure 4], [Figure 5], [Figure 6], [Figure 7], [Figure 8]. Three significant negative correlations were found between subjective stress and HRV measures: (1) perceived stress and 5-minute mean interbeat interval (IBI), r = −0.217, P < 0.05; (2) perceived stress and 5-min SDNN, r = −0.255, P < 0.05, and (3) perceived stress and Ln 5-min RMSSD, r = −0.282, P < 0.01. Significant negative correlations were found between age and the HRV measures; 1-min SDNN (r = −0.235, P < 0.01), 5-min SDNN (r = −0.290, P < 0.01), 5-min RMSSD (r = −0.395, P < 0.01), total power (r = −0.272, P < 0.05), VLF (r = −0.215, P < 0.05), and HF (r = −0.402, P < 0.01). There are more significant relationships between the HRV measurements during the 5-min resting period than with the 1-min deep breathing assessment. First of all, a significant positive correlation was found between emotional stress and the MHRR, r = 0.216, P < 0.05. A significant negative correlation was found between normalized coherence and relational tension (r = −0.222, P < 0.05). A significant positive correlation was found between intention to quit and 5-min Ln VLF, r = 0.234, P < 0.05. The PSS and POQA-R4 were strongly correlated, except for relational tension. The research study presented descriptive statistics and quantitative correlational results between HRV (objective stress), PSS, and POQA-R4 (subjective self-reported stress) that attempted to answer the following research questions. Research question 1: In what way can heart rate variability be used to accurately measure the effects of workplace stress? HO: There is no (statistically significant) relationship between HRV and workplace subjective stress (H0: R = 0). 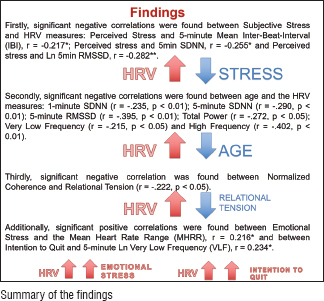 H1: There is a (statistically significant) relationship between HRV and workplace subjective stress (H1: R<>0). Since there were three significant negative relationships between PSS (short-term stress) and HRV; perceived stress and 5-min IBI, r = −0.217, P < 0.05; perceived stress and 5-min SDNN, r = −0.255, P < 0.05; and perceived stress and Ln 5-min RMSSD, r = −0.282, P < 0.01, H0 would be rejected. This indicates that overall HRV is significantly correlated with short-term perceived workplace stress. Research question 2: What are the effects of workplace stress on heart rate variability? A negative relationship between short-term perceived stress and HRV means that the lower the short-term perceived stress, the higher the overall HRV the person is capable of producing. Moreover, a significant positive correlation was found between emotional stress and the MHRR, r = 0.216, P < 0.05, which indicates that the higher the emotional stress an employee faces, the higher his or her HRV. Research question 3: In what way does heart rate variability compare with self-reports of stress? The participants self-report results on the POQA revealed the stressors and after effects of employee stress. 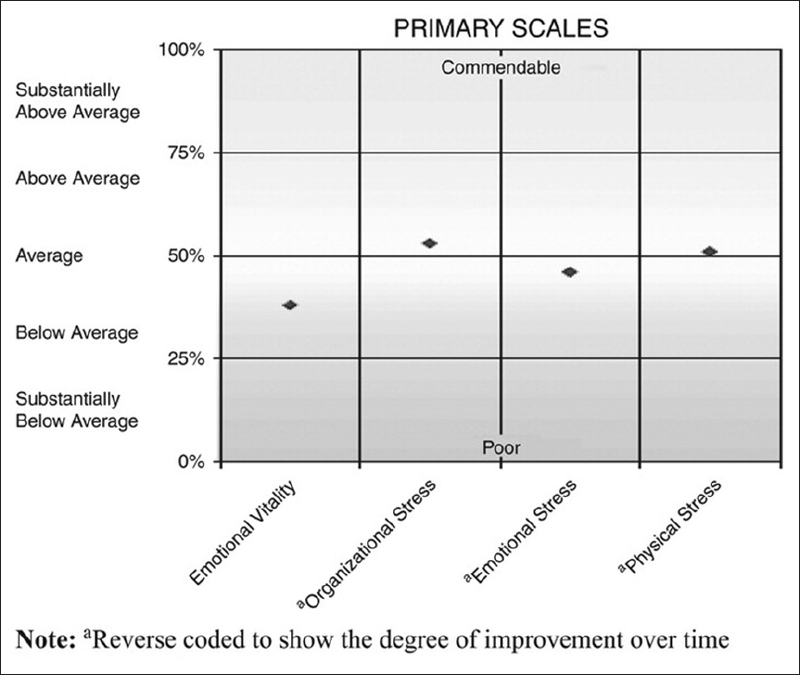 Comparing the four primary scales of the organizational scores to norms from a large convenience sample of 5971 working adults, [Figure 9] shows that out of the four primary scales: emotional vitality, organizational stress, emotional stress and physical stress, with emotional vitality and emotional stress within the below average range. From the correlational analysis, it was reported that a significant positive correlation was found between emotional stress and the MHRR, r = 0.216, P < 0.05, which indicates that the higher the emotional stress an employee faces, the higher his or her HRV. 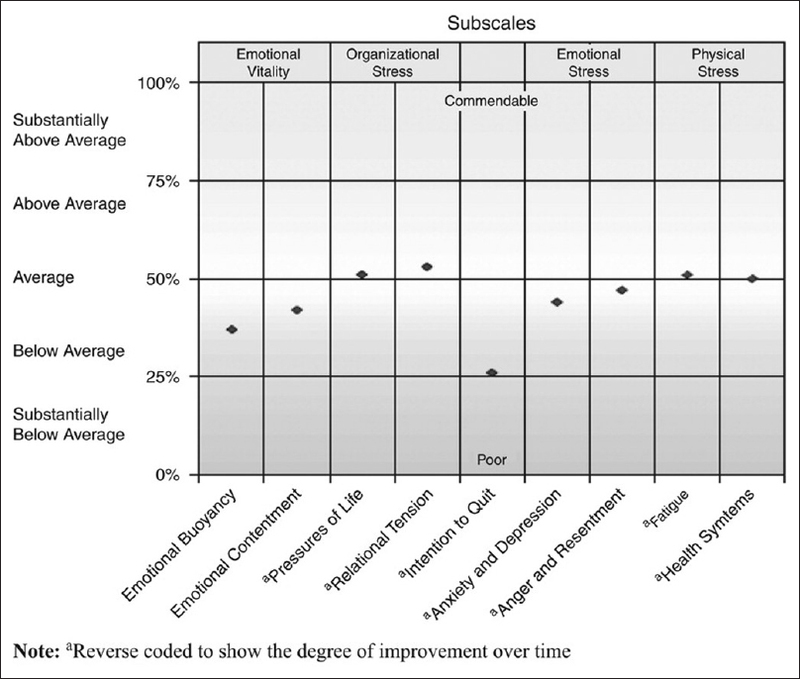 Moreover, from the associated subscales in [Figure 10], out of the nine subscales, emotional buoyancy, emotional contentment, intention to quit, anxiety and depression, and anger and resentment were within the below average range. A significant positive correlation was found between intention to quit and 5-min Ln VLF, r = 0.234, P < 0.05, which indicates that healthier employees may have higher intentions of quitting their jobs. Research question 4: What is the overall level of comfort a typical Hong Kong employee experiences? A significant negative correlation was found between age and the HRV measures; 1-min SDNN (r = −0.235, P < 0.01), 5-min SDNN (r = −0.290, P < 0.01), 5-min RMSSD (r = −0.395, P < 0.01), total power (r = −0.272, P < 0.05), VLF (r = −0.215, P < 0.05), and HF (r =−0.402, P < 0.01). This indicates that the older the employee, the lesser his or her overall HRV. A significant negative correlation was also found between relational tension and normalized coherence (r = −0.222, P < 0.05), which may indicate that the healthier an employee, the lesser the relational tension. The mean PSS score is 17.69 where 13 is considered average while 20 or above is considered high stress. On the other hand, the mean overall stress score in the POQA is 8.4 where 0 is the lowest (most calm) and 14 is the highest (most stressed). In this study, it was hypothesized that POQA and PSS would have a negative correlation with HRV. In line with the findings of previous studies, there were more significant relationships between the HRV measures and PSS than with the POQA. Most historical workplace stress research that correlates HRV with workplace stress shows a negative correlation between the variables. For instance, the results are consistent with those of da Silva et al. when they assessed the correlation between PSS and HRV parameters and reported that the increase in perceived stress is correlated to a lower HRV in healthy young subjects. Moreover, da Silva et al. analyzed data from 35 healthy young volunteers and found a significant correlation between perceived stress and LF (ms2) by frequency domain HRV analysis. Probably due to the smaller number of subjects, other global variables such as total power and SSDN also had negative coefficients but did not have any significant correlation with PSS-14, yet this study contributed to the literature three additional significant negative correlations between PSS and HRV, with (1) perceived stress and 5-min mean IBI; (2) perceived stress and 5-min SDNN; and (3) perceived stress and Ln 5-min RMSSD. Similarly, Föhr et al. found that subjective self-reported stress has been associated with the objective physiological stress which is consistent with the result of this research. Hence, Föhr et al. suggested that the objective stress assessment such as HRV provides an additional aspect to the evaluation of stress. It was surprising to see a significant positive correlation between emotional stress and the MHRR, which indicates that the higher the emotional stress an employee faces, the higher his or her HRV. At first glance, it seems counterintuitive; however, the researcher offers four perspectives to explain this surprising finding. According to Turiano et al., it appears that an employee can be a “healthy neurotic.” Turiano et al. concluded that the health anxiety that employees who are high in neuroticism or emotional stress may feel adaptive when it is accompanied by high conscientiousness. In other words, neuroticism or emotional stress may lead a person to worry, but conscientiousness leads a person to be self-disciplined and to take action when one's behavior veers into the unhealthy range. The unhealthy neurotics are the ones whose low conscientiousness means that they have fewer healthy coping mechanisms. Turiano et al. further pointed out that when employees were stressed and unhappy, they might turn to overeating, drinking, and smoking. Nevertheless, they said that it was possible that other known health culprits could play a role such as lack of sleep or even a relationship conflict. Numerous research studies have established that using emotion suppression, whether routinely or experimentally induced, is associated with unhealthy well-being. Moreover, emotion suppression eliminates the experience of positive emotions while enhancing the experience of negative emotions. Contrary to Western cultures, the Asian culture tends to mask negative emotions which are deemed as signs of maturity and awareness. In addition, their reluctance to express negative emotions has potential negative relational concerns which threaten group harmony. This may provide insights into the current research which holds the view that unhealthy Asian employees tend to suppress their emotions and that the suppressed emotions are not regulated successfully. Emotion regulation involves the process by which people manage both negative and positive emotions. Furthermore, successful emotion regulation, by either reappraisal or suppression, has been shown to lead to increased vagally mediated HRV. Fujimura and Okanoya therefore suggest that healthier employees (in this research study) are able to better regulate their emotional stress as compared to the unhealthier ones because participants with a high baseline of vagally mediated HRV may be spontaneously using emotion regulation strategies more often during an emotional conversation than participants with a low baseline of vagally mediated HRV. As the majority of the participants in this research were between the age of 21 and 40 years (considered as a young population group), according to McCraty, these participants are possibly still physiologically resilient, and as the amount of HRV reflects long-term processes, emotional stress traits would not show up until later in life, reflecting a depletion of the wear and tear on the ANS (personal communication, October 10, 2017). From the POQA, the low score of emotional vitality indicates low scores on both emotional buoyancy and emotional contentment subscales. A low score on the emotional buoyancy subscale indicates that it is likely that the employees feel that they have low levels of emotional energy available for investment in their work and personal lives. A low score on the emotional contentment subscale suggests that the employees may be feeling only low levels of contentment and inner peace with their lives, both at work and off the job. On the same side of the coin, the low score of emotional stress as shown in [Figure 9] indicates low scores on both the anxiety/depression and the anger/resentment subscale in [Figure 10]. When looking at the normative summary scales which are reverse coded, low scores on the anxiety/depression subscale indicate that a notable proportion of employees may be experiencing high levels of anxiety, unhappiness, sadness, and/or depression. Low scores on the anger/resentment subscale indicate that a notable proportion of employees may be experiencing high levels of anger and resentment and may experience difficulty in controlling their feelings and emotions. Hence, from the correlational analysis, it was reported that a significant positive correlation was found between emotional stress and MHRR, which indicates that the higher the emotional stress an employee faces, the higher his or her HRV. Discussions on this were noted in Research Question 2. 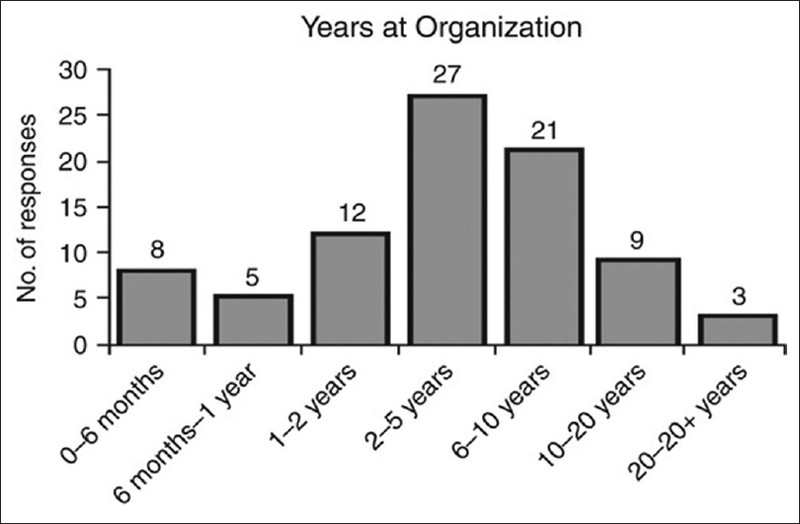 The poor score on this subscale in the POQA indicates that there is an increased likelihood of a notable proportion of employees who are feeling sufficiently dissatisfied with their work environment and that they are thinking about leaving the organization (i.e., quitting their jobs). Yet, another surprising finding from the research is that a significant positive correlation between intention to quit and 5-min Ln VLF which indicates that healthier employees may have higher intentions of quitting their jobs. From the literature review, a VLF peak, ranging between 0.0033 and 0.04 Hz, is associated with an increased risk of adverse effects, and the VLF has stronger correlations with “all-cause mortality” than HF and LF power. According to McCraty and Shaffer, a lower VLF is the most predictive of future health problems since a low VLF power is associated with arrhythmic death and posttraumatic stress disorder. Furthermore, the low power in VLF is associated with high inflammation and has been correlated with low levels of testosterone. In line with previous research findings, significant findings between age and the HRV measures indicate that the older the employee, the lesser his or her overall HRV. It is surprising however that the MHRR in the 1-min deep breathing assessment was not as significantly related to age, especially as age was highly correlated with the SDNN and RMSSD in the 5-min resting HRV assessment. A possible explanation for this is that the 1-min deep breathing assessment is a challenge test that is getting at how much overall HRV the participants' system is capable of producing at that time. Having that in mind, the majority of the participants in this research were between the age of 21 and 40 (considered as a young population group), which possibly explains why the age correlations in the 1-min assessments were not stronger if the age range was not wide enough. A significant negative correlation was also found between relational tension and normalized coherence, which may indicate that the healthier an employee, the lesser the relational tension. According to McCraty, relational tension is clearly a source of stress, and he suggests that it is one of the most harmful types of stress. When there is a lower coherence in the 1-min test, especially if the amount of HRV is within the normal range (MHHR and SDNN), he suspects that it indicates an issue with the coupling of the respiratory and the cardiovascular systems within the brainstem. He postulates that this will eventually be shown to be an early warning indicator and is associated with future health challenges (personal communication, September 26, 2017). Furthermore, McCraty states that relational tension due to lack of coupling and alignment with others may be reflected in lower coupling of the respiratory and cardiovascular systems. He describes how HRV synchronization between mothers and young children nourishes a biological synchronized rhythm which provides the foundation for a social rhythm for the child. Hence, the development of one's internal biological oscillators is critical to future social connection and self-regulation. The mean PSS score is 17.69 where 13 is considered average while 20 or above is considered high stress. On the other hand, the mean overall stress score in the POQA is 8.4 where 0 is the lowest (most calm) and 14 is the highest (most stressed). In this study, the correlational analysis between PSS and POQA is significantly correlated; therefore, this suggests that the overall level of comfort an employee experiences is a level close to high stress. Moreover, from the discussions in Research Question 3, out of the four primary scales: emotional vitality, organizational stress, emotional stress, and physical stress, both emotional vitality and emotional stress are within the below average range, while the rest of the scales are in the average range. The poor score on the intention to quit subscale of POQA is the most surprising finding and is considered a red flag to management as it indicates that a notable proportion of employees are feeling sufficiently dissatisfied with their work environment that they are thinking about quitting their jobs. A limitation of measurement bias might have occurred since the survey data were self-reported; results depended on the effort and honesty of each participant. Participants in the study might have been reluctant to give socially unacceptable answers in the questionnaires, for fear of being judged or are not self-aware enough to provide accurate responses. This might skew the results and caused errors in the correlational analysis. Since the research was on workplace stress, another limitation of surrogate information error might have occurred because the stress the employees experienced might have been nonworkplace related such as family bereavement and loss, relationship breakdown, financial problems, family illnesses, and commuting pressures. It was also observed that the age range of the participants seemed to have skewed toward the younger population group of 21–40 and this might have led to a design bias limitation. Furthermore, participants that came from four lines of services within the corporation were not equally distributed – Department A (57.6%), Department B (11.7%), Department C (22.3%), and Department D (8.2%), which might have delineated a narrow demographic range of the corporation known as a measurement bias. According to an article search, this was the first research conducted on the relationship between HRV, POQA, and PSS in Hong Kong and using HRV as a potential physiological objective measurement for workplace stress. The sample size (n = 85) of HRV measures was relatively large compared to other research studies, and according to Clinical and Translational Science Institute, the total sample size was of a significant level to achieve a power of 0.80 and an estimated effect size of 0.30. The overall research also implied that an average employee experiences a close to high level of workplace stress on a regular basis and therefore presenting a universal threat to organizational costs and workplace performance. The research data have concluded that emotional stress and relational tension are inherent in the workplace. Emotional stress may deplete one's internal resources regardless of whether one is healthy or nonhealthy. Consequently, employee turnover may occur when employees are dissatisfied with the workplace environment. Besides, existing employees who do not have any intention of quitting may be exhibiting immobilization with (or without) fear, leading to a drop in workplace performance. It is therefore very critical to find new and effective tools such as HRV assessments to measure and monitor stress as well as having effective interventions to reduce and prevent workplace stress. It is recommended that organizations ought to implement organizational resilient strategies such as corporate wellness programs and the role of care managers as an integral part of a strategic framework of change management initiatives. The act of being mindful for employees and leaders within an organization means to be aware in the present moment, intention in thought, and purposeful in action. In addition, beneficial outcomes for the overall organization include competitive advantages, employee engagement, decreased attrition, increased productivity, better well-being, leadership development, and better collaboration, leading to healthier organizational culture, climate, longevity, and social coherence. A purpose of having future research is to align the various researches with the social and global coherence notion propelled by the HeartMath Institute. Future research will continue to address topics ranging from stress to reducing violence, reducing health costs, emotional regulation, biofeedback interventions, stress management, and even other nonworkplace topics such as the academic performance of children of different ages, Post-traumatic stress disorder (PTSD), intuition, and much more. Hence, further research on the effects of employee stress and HRV needs to be conducted. The researcher has several suggestions for future research. Similar research can be conducted in other countries with a more diversified age group. A second way is to repeat the research with other subjective perceived stress surveys. Integrating the works of McCraty and Porges, comparable studies on heart–brain and face–heart connections can be further explored to add to the current body of knowledge regarding relational tension and resilience. Future research studies could use HRV stress measurements to evaluate the effectiveness of stress management interventions. Based on the findings, organizations can objectively identify the most effective intervention types and customize an employee assistance program to reduce workplace stress. Another study could include repeating the original research with additional primary biomarkers which can serve as confirmatory approaches. This research has explored the correlation between a new quantitative stress measurement known as the emWave Pro Plus and compared it with two other sets of quantitative self-reported perceived stress data: the POQA from HeartMath and the PSS. This research has looked at the effects of the employees' workplace stress on HRV. Two surprising findings have been found in the research in terms of emotional stress and intention to quit. First, a significant positive correlation has been found between the emotional stress and the MHRR, which indicates that the higher the emotional stress an employee faces, the higher his or her HRV. Second, a significant positive correlation has been found between intention to quit and 5-min Ln VLF, which indicates that healthier employees may have higher intentions of quitting their jobs. Discussions have been held to explain these surprising findings to make sense of the data. The research shows that promising results and future studies should continue to tap into HRV as an objective measure of mental health and workplace stress. World Health Organization. The Top 10 Causes of Death. World Health Organization; May, 2014. Available from: http://www.who.int/mediacentre/factsheets/fs310/en/. [Last retrieved on 2016 Jul 19]. Chandola T, Britton A, Brunner E, Hemingway H, Malik M, Kumari M, et al. Work stress and coronary heart disease: What are the mechanisms? Eur Heart J 2008;29:640-8. Kivimäki M, Kawachi I. Work stress as a risk factor for cardiovascular disease. Curr Cardiol Rep 2015;17:630. Babatunde A. Occupational stress: A review on conceptualisations, causes and cure. Econ Insights Trends Chall 2013;2:73-80. Shaffer F, McCraty R, Zerr CL. A healthy heart is not a metronome: An integrative review of the heart's anatomy and heart rate variability. Front Psychol 2014;5:1040. Schroeder EB, Liao D, Chambless LE, Prineas RJ, Evans GW, Heiss G, et al. Hypertension, blood pressure, and heart rate variability: The atherosclerosis risk in communities (ARIC) study. Hypertension 2003;42:1106-11. Kemp AH, Quintana DS, Gray MA, Felmingham KL, Brown K, Gatt JM, et al. Impact of depression and antidepressant treatment on heart rate variability: A review and meta-analysis. Biol Psychiatry 2010;67:1067-74. McCraty R, Shaffer F. Heart rate variability: New perspectives on physiological mechanisms, assessment of self-regulatory capacity, and health risk. Glob Adv Health Med 2015;4:46-61. Sambasivam M, Gururajan N. Chaotic behaviour of heart rate variability through discrete dynamical model. Int J Sci Eng Res 2013;4:1-6. Reyes del Paso GA, Langewitz W, Mulder LJ, van Roon A, Duschek S. The utility of low frequency heart rate variability as an index of sympathetic cardiac tone: A review with emphasis on a reanalysis of previous studies. Psychophysiology 2013;50:477-87. Beauchaine TP, Thayer JF. Heart rate variability as a transdiagnostic biomarker of psychopathology. Int J Psychophysiol 2015;98:338-50. Khazan IZ. The Clinical Handbook of Biofeedback: A Step-by-Step Guide for Training and Practice with Mindfulness. Hoboken, NJ: Wiley-Blackwell; 2013. Muchinsky PM, Culbertson SS. Psychology Applied to Work: An Introduction to Industrial and Organizational Psychology. 11th ed. Summerfield, NC: Hypergraphic Press, Inc.; 2016. Shaw L, Wilson V, Nihon S. Getting off the bench: EEG and HRV differences between starters and nonstarters. Biofeedback 2012;40:34-8. Hillebrand S, Gast KB, de Mutsert R, Swenne CA, Jukema JW, Middeldorp S, et al. Heart rate variability and first cardiovascular event in populations without known cardiovascular disease: Meta-analysis and dose-response meta-regression. Europace 2013;15:742-9. Panari C, Guglielmi D, Ricci A, Tabanelli MC, Violante FS. Assessing and improving health in the workplace: An integration of subjective and objective measures with the STress assessment and research toolkit (St.A.R.T.) method. J Occup Med Toxicol 2012;7:18. Spector PE, Jex SM. Development of four self-report measures of job stressors and strain: Interpersonal conflict at work scale, organizational constraints scale, quantitative workload inventory, and physical symptoms inventory. J Occup Health Psychol 1998;3:356-67. Lazarus RS. Theory-based stress measurement. Psychol Inquiry 1990;1:3-13. Mauss D, Jarczok MN, Fischer JE. The streamlined allostatic load index: A replication of study results. Int J Biol Stress 2016;19:553-8. [doi: 10.1080/10253890.2016.1219718]. Yoshikawa H, Weisner TS, Kalil A, Way N. Mixing qualitative and quantitative research in developmental science: Uses and methodological choices. Dev Psychol 2008;44:344-54. Leedy PD, Ormrod JE. Practical Research: Planning and Design. 10th ed. Harlow: Pearson Education Limited; 2014. Murphy KR, Myors B, Wolach A. Statistical Power Analysis: A Simple and General Model for Traditional and Modern Hypothesis Tests. 4th ed., Rev. New York: Routledge; 2014. Clinical and Translational Science Institute. Sample Size Calculators; 6 February, 2017. Available from: http://www.sample-size.net/correlation-sample-size/. [Last retrieved on 2017 Mar 15]. Barrios-Choplin B, Atkinson M. Personal and Organizational Quality Assessment. Boulder Creek, CA: Institute of Heart Math; 2000. Cohen S, Williamson G. Perceived stress in a probability sample of the United States. In: Spacapam S, Oskamp S, editors. The Social Psychology of Health: Claremont Symposium on Applied Social Psychology. Newbury Park, CA: Sage; 1988. Institute of Heart Math. Em Wave Pro Tour User Manual; 2016. https://www.heartmath.com/support/knowledgebase/?article=kA180000000CsvqCAC and t=emWave+Pro+Tour+User+Manual. [Last retrieved on 2018 Jan 23]. Russoniello CV, Zhirnov YN, Pougatchev VI, Gribkov EN. Heart rate variability and biological age: Implications for health and gaming. Cyberpsychol Behav Soc Netw 2013;16:302-8. McCraty R, Watkins A. Autonomic Assessment Report: A Comprehensive Heart Rate Variability Analysis-Interpretation Guide and Instructions. Boulder Creek, CA: Institute of HeartMath; 1996. Task Force of the European Society of Cardiology and the North American Association of Pacing and Electrophysiology. Heart rate variability: Standards of measurement, physiological interpretation, and clinical use. Eur Heart J 1996;17:354-81. IBM Corp. Released 2013. IBM SPSS Statistics for Windows, Version 22.0. Armonk, NY: IBM Corp; 2013.
da Silva AG, Araujo DN, Costa AC, Dias BA, de Freitas Fregonezi GA, Dias FA. Increase in perceived stress is correlated to lower heart rate variability in healthy young subjects. Acta Sci Health Sci 2015;37:7. Föhr T, Tolvanen A, Myllymäki T, Järvelä-Reijonen E, Rantala S, Korpela R, et al. Subjective stress, objective heart rate variability-based stress, and recovery on workdays among overweight and psychologically distressed individuals: A cross-sectional study. J Occup Med Toxicol 2015;10:39. Turiano NA, Mroczek DK, Moynihan J, Chapman BP. Big 5 personality traits and interleukin-6: Evidence for “healthy neuroticism” in a US population sample. Brain Behav Immun 2013;28:83-9. Tsai W. Cultural differences in emotion expression and suppression: Implications for Health and Well-Being (Doctoral dissertation, UCLA); 2016. Fujimura T, Okanoya K. Heart rate variability predicts emotional flexibility in response to positive stimuli. Sci Res 2012;3:578-82. McCraty R. New frontiers in heart rate variability and social coherence research: Techniques, technologies, and implications for improving group dynamics and outcomes. Front Public Health 2017;5:267. Porges SW. Vagal pathways: Portals to compassion. In: Seppala EM, editor. The Oxford Handbook of Compassion Science. Oxford University Press: New York, USA;2017. Shuttleworth M. Research Bias; 2009. Available from: http://www.experiment-resources.com/research-bias.html. [Last retrieved on 2018 Mar 29].